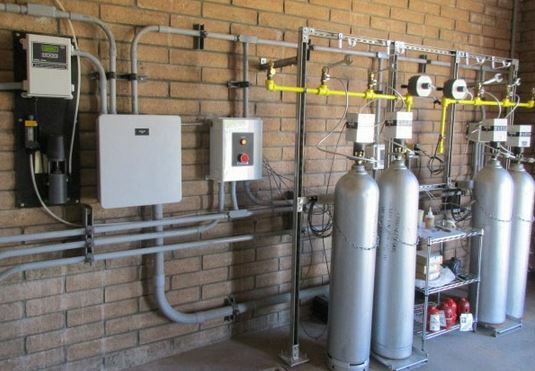 Chlorine Gas Feed System – JCS Industries with Automatic Shutoff Actuators ROBO-Control | JCI Industries Inc.
JCS Industries Chlorine Gas Products feature significantly enhanced safety for the use of chlorine gas for disinfection, while providing dramatically reduced chemical and energy costs. In particular, special automatic valve shutoff actuators shut down the gas system upon leak detection, a key feature that allows for use of chlorine gas as the most cost-effective method for disinfection. In recent changeover from other technology, a customer has saved $13,000 per MGD per year in chemical savings alone. In typical systems, Chlorine gas is injected into a water supply line that creates a Venturri (suction). 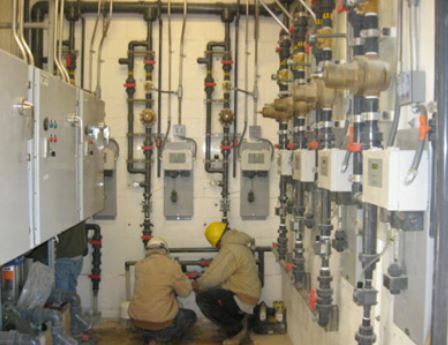 System controls allow for chlorine dosing as required. The system incorporated safety features for protection of personnel and equipment in the event of a chlorine leak. Chlorine gas cylinders (150 lb cylinder or 1 ton portable tanks) are set up on scales, with a vacuum regulator on each cylinder or tank. The vacuum injector closes when cylinders are empty, and automatically switches flow over to the other two cylinders with an automatic switchover unit between two units. Upon chlorine leak detection, automatic valve actuators shut down all cylinders or tanks, a siren is activated and n exhaust fan, and activate a siren and beacon. The atmosphere in the equipment room is continuously monitored. Large systems have cylinders or portable tanks manifolded together to help minimize project cost by avoiding the need for a regulator on each cylinder. The setup can be expanded to multiple cylinders on each side. The banks of cylinders can be setup on pressure headers, so that chlorine is withdrawn equally from either side. At the end of each header is an automatic switchover vacuum regulator, with dedicated drip leg and heater. One cylinder on each bank can be independently measured on the scale, which displays the total sum of each bank of cylinders. For single source responsibility, the same manufacturer supplies the leak detection system, the emergency shutoff actuators, the scales, the chlorinators, the vacuum regulators, and the vacuum injector, all of which are USA-made. single or dual cylinder operation, with independent analog or adjustable outputs. 8 Chlorine gas feeders ranging from 5 to 250 ppd. Ultimate capacity of 10.0 ppd chlorine per feeder. Redundant flow proportional and compound loop control.